As we leave the EU, free movement is coming to an end, the jurisdiction of the European Court of Justice will no longer apply, and the days of sending vast sums of money to Brussels every year are over for good. This plan is a good deal for Britain, for the British people and for businesses in this country. However, if we cannot reach agreement with the EU, the Prime Minister is clear that no deal remains better than a bad deal and preparations for this are being intensified. 1. Leaving the European Union on 29th March 2019. 2. A complete end to freedom of movement, taking back control of our borders. 3. An end to the jurisdiction of the European Court of Justice in the UK, restoring the supremacy of British courts. 4. No more sending vast sums of money each year to the EU – instead a Brexit dividend to spend on domestic priorities like our long-term plan for the NHS. 5. Frictionless trade in goods and flexibility on services. 6. 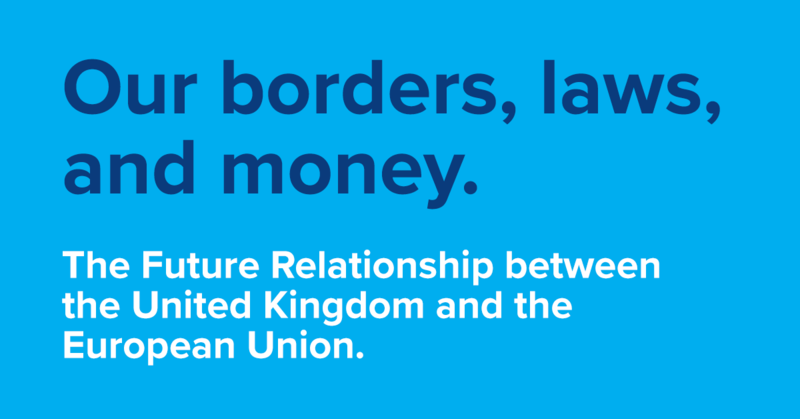 No hard border between Northern Ireland and Ireland – or between Northern Ireland and Great Britain. 8. A commitment to maintain high standards on consumer and employment rights and the environment. 9. Leaving the Common Agricultural Policy and the Common Fisheries Policy. 10. The freedom to strike new trade deals around the world – and we’re already consulting on these. 11. Continued security co-operation to keep our people safe. 12. An independent foreign and defence policy.